Terrell Brown got early rest in Tuesday night's 6A boys basketball title game as he went to the Basha bench with two fouls. When he returned in the second period he was loaded for bear -- or was it Aztec. Brown reeled off 11 points of a 13-0 Basha run before halftime and combined with hard-nosed, team defense throughout keyed the second-seeded Bears' eventual 75-65 victory over top-seeded Corona del Sol at Grand Canyon University. The title is the first boys team championship in the school's 15-year history. Basha notched its 30th win of the season against only one loss in its fourth season under coach Mike Grothaus. The Bears have progressed in wins (10-19-23-30) and state tournament longevity each year under Grothaus. Corona (26-4), was shooting for its ninth state title and competing in its 14th championship game in four decades the school has been open. "Defense and rebounding, that's our calling card,' Grothaus, who played for a state title team at Gilbert High in 2003, said. "(Corona) has two great players and we have five great defenders. Brennen Davis was tremendous defending Saben Lee. And Brown, that's what he does. We got contributions from everyone. It's all about team." Brown, who took a seat in the final minute of the first period, missed five minutes of action before returning with under four minutes left in the second period. Corona led at that point, 28-26, but a basket by Brown tied things at 28 with 3:05 to the half. About 90 seconds later, Brown calmly buried three, 3-point shots on successive trips down the floor and the Bears' lead was 37-28. They took a 39-30 advantage to intermission. Corona del Sol made a run at Basha in the third period, narrowing the deficit to four late in the third period. It was a two-possession game heading to the final stanza. Coleson Struh's only points of the game -- a three to open the fourth period -- pushed the lead to nine. One more run keyed by Brown and McGlothan, both of whom played with four fouls much of or all the final period, essentially put Corona away. Basha guard Austin Picarello made sure making 9 of 10 free throws in the final 2:07 and finished with 11 points. Corona del Sol coach Neil MacDonald gave credit where it was due without hesitation. "We missed shots, but they made us miss shots," MacDonald said. "It was a privilege to play in this game, and we gave it all we had. The shots Brown made, especially those three 3s hurt. But we got out of that hole. Got within a possession and then couldn't get over that hump." "I can't say enough about our defense," McGlothan said. "Brennan Davis, Terrell Brown. It took us a litlte while to get our feet under us. The defense was there all the time." Barcello closed out a fabulous, four-year career at Corona with two state titles and three title game appearances with a game-high 25 points and team-high eight rebounds along with Lee. Barcello was not as effective in the second half, hitting just 3 of 11 shots. Lee, the other half of Corona's 1-2 punch this season and headed to Vanderbilt, finished with 19 points. Eleven were scored in the final 2 1/2 minutes when the outcome was no longer in doubt. Lee was 2 of 8 from the field with eight points through the first three quarters. When Basha and Desert Ridge played early this season, the Bears needed a buzzer-beater to prevail. In their 6A quarterfinal matchup on Saturday night, the game was over long before that. No. 2 Basha, led by Terrell Brown's 25 points, opened up a double-digit lead after one quarter and never looked back in dismantling No. 10 Desert Ridge, 68-40, at Basha High. Basha (28-1) returns to the big-school semifinals for the second consecutive season. The Bears take on No. 3 Desert Vista, a 59-53 winner over Brophy Prep. Basha and Brophy meet Thursday Feb. 23 at 6 p.m. at Gila River Arena. That game will be followed at 7:30 by No. 1 Corona del Sol against No. 4 Cesar Chavez. They won their quarterfinal games over Westview and Pinnacle, respectively. Basha, which edged Desert Ridge 34-33 in what Bears coach Mike Grothaus described as an "ugly game' on Dec. 2, took more pride in this triumph. "Our guys came out and played great," Grothaus said. "Very proud of them. We got after it defensively right away, hit some shots and shared the ball. That's the way we like to play." Basha connected on 8 of 13 shots in the first quarter, including a perfect 5-for-5 from 3-point range in amassing a 21-10 lead. Brown, the NAU-bound football and basketball standout, scored eight points in the first quarter and sank two of the threes. Austin Picarello, Coleson Struhs and Amari Hudson added one 3 apiece. Brown made 9 of 11 shots from the field for the game - four of them threes. He was active on the offensive glass as well with a trio of putbacks. Basha used a 20-8 edge in the second quarter to build its lead to 41-18. Brown scored 11 points in the period and forward Gabe McGlothan six of his 13 points for the night. Brennan Davis chipped in 10 points for Basha (eight in the third period). Desert Ridge (14-15), led this season by senior guard Keith Holmes and forwards Jalen and Jason Harris, saw Holmes get untracked with eight points in the first period. The Harris's (6-foot-5 senior Jalen and 6-8 freshman Jason, struggled. They both left two minutes apart in the third period with their fourth fouls, but by then the game was out of hand. Jason Harris finished with 5 points and Jalen with two. The Harris's were defended well in the first period and by late in the quarter and early in the second were in foul trouble. Each had three fouls and sat for more than half the second quarter. They combined for two points in the first half. "They were making everything, and we couldn't find the basket," Desert Ridge coach Greg Ream said. "I think we had them 7 of 10 from 3-point range in the first half. They've improved a ton since we played them the first time. They beat our behinds on the boards. We had no rhythm on offense. Hats off to them. They're a great team." 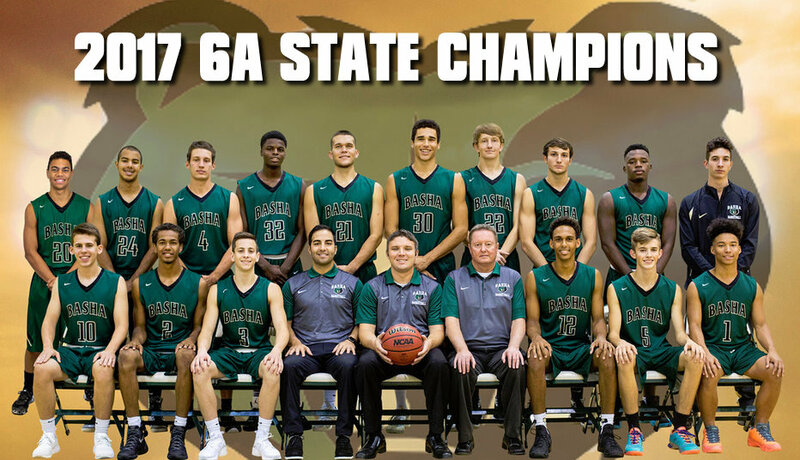 A year ago, the Basha boys basketball found itself on the losing end of the state semifinal game to Mesa. The second-seeded Bears avenged their loss Wednesday, beating Mesa 62-45 in the first round of the 6A state tournament, behind the stellar performance of senior Gabe McGlothan. The Bears (27-1) had to win it down that stretch against the defending state champions. After starting the fourth quarter on a 6-2 run, Mesa pulled within two with just over five minutes to play. Instead of panicking, McGlothan and company returned to the game plan. Basha locked in and played championship defense, led by a Terrell Brown steal that led to a thunderous dunk by McGlothan with four minutes to go. A three-pointer by Coleson Struhs sealed the deal for Basha, pushing the lead to double digits. Fouls plagued the Jackrabbits down the stretch, allowing Basha to pull away in the final minutes. McGlothan led the way for the Bears with a 17-point, 13-rebound effort in front of a rowdy Basha crowd. Basha, which will host No. 10 Desert Ridge on Saturday at 6:30 p.m., started slow. That allowed the Jackrabbits (19-9) kept it close in the first half, taking only a one-point, 30-29 lead into intermission. Mesa’s full-court press helped force six first-half turnovers. Bears coach Mike Grothaus made adjustments to eliminate costly turnovers and poor defense. The Bears began the second half with an 8-0 run. Mesa kept the game close, responding with a 6-0 run of their own late in the third quarter. A pair of free throws put the Bears up by six entering the fourth quarter. Mesa ended its season without getting out of the first round after winning it all a year ago. Junior guard Mark Hatch led the way for Mesa with 15 points, while sophomore Zach Hobbs chipped in 12 points, including 2 for 3 behind the arc. While it may have not been the outcome Mesa coach Shane Burcar had hoped for, he couldn’t be more proud of his seniors and optimistic for the future of Mesa basketball. Basha’s undefeated record is a good start, but team wants more - 01/08/17 - Terrell Brown was hitting shots from all over the court, Gabe McGlothan was owning the block and the Basha boys basketball team was in a groove that started somewhere around the first tip-off the season. And yet coach Michael Grothaus called a timeout while the Bears were in the midst of another surge against a quality opponent, about to pull away. With Terrell Brown defending, Gabe McGlothan rebounding, Bryan Baptiste dribbling, and Coleson Struhs knocking down 3-pointers, Chandler Basha doesn't appear to have a weakness. Until they start wanting to make highlight plays. Coach Mike Grothaus got on his players during a timeout, barking out, "Stop being highlight heroes," feeling points were being left on the floor. 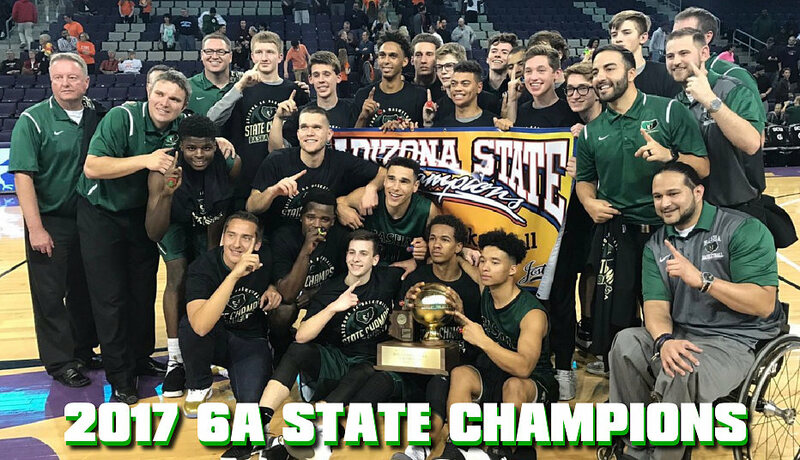 Basha, the No.1-ranked boys basketball team in the 6A Conference since preseason, finally put away host Chandler Hamilton in the second and third quarters and clinched the Premier Region championship with a 50-34 victory on Friday night. This is the first time Basha has ever been undefeated this deep into a season. At 25-0, why stop now? The Bears, 7-0 in the section, has just two games left in the regular season, finishing with Scottsdale Desert Mountain and Gilbert Perry, before they can start thinking about correcting the way things ended last year, losing in the state semifinals. "Everyone just wants to win state," said McGlothan, who once again was a beast on the boards. "Everybody is striving for that." Hamilton (16-7, 3-3) held its own in the opening eight minutes and led 18-14 in the first minute of the second quarter, before Basha went on a 14-0 run that included a steal and dunk by Brown. Brown closed the half with a 3-pointer that gave Basha a 31-22 lead. Brown, who had 10 points, drew the defensive assignment against Hamilton's best player, 6-foot-5 guard Rashad Smith. Smith, who came into the game averaging 15 points, had just three points before Brown's evening was over with Basha building a 46-24 lead. Smith scored eight points in the final 2:20 with Brown on the bench. Hamilton was held to just two third-quarter points. "He's a really good player," Brown said. "We're real good friends. "I was trying to stay a little closer so he wouldn't pull up for a 3. And I wouldn't let him get by me." 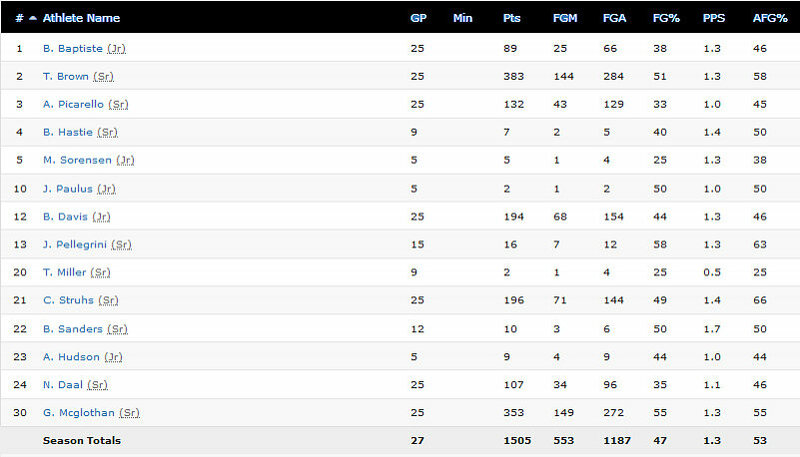 Baptiste's ability to break down Hamilton's defense off the dribble helped set up Struhs from the outside. Struhs made four 3-pointers and finished with 14 points. Basha's biggest challenge in section has come against Phoenix Brophy Prep, winning both meetings, one of those at Brophy in overtime. The goal is to finish it off in the regular season and head into state with momentum and a defensive mindset while continuing to share the ball. "We don't look at what we've done in the past," Grothaus said. "We're continuing to get better. We want to be playing our best basketball in the last month." Terrell Brown was in and out of Basha's lineup Friday night as the progression of fouls he accumulated limited him in a stretch of the first half and early in the final period. But when Brown was on the court, the Bears had the spark they needed to turn back upset-minded Hamilton. Brown and Basha capitalized on turnovers and baskets in transition late to overcome Hamilton, 44-32, in a 6A Premier Region game at Basha High. Basha remained unbeaten at 19-0 overall and 2-0 in region with defense as usual serving it well. The Bears shot poorly most of the game -- 26 percent for better than three quarters. They outscored Hamilton 24-6 in the second half. Still the game was up for grabs before two late buckets by Brown in the final two minutes provided separation. "Terrell didn't miss a minute in our last game, never came off the court," Basha coach Mike Grothaus said of the Bears Wednesday OT win over Brophy Prep. "Tonight he got a couple quick ones and had to come out. Then we had to sit him in the fourth. You take the good with the bad. He made plays when we needed them. "We didn't shoot well, and some of that was their zone. Our defense allowed us to overcome." Basha, which jumped out to a 9-0 lead three minutes into the game, found itself trailing 15-12 after the first quarter. Hamilton's run came mostly with Brown on the bench with two fouls. The deficit was courtesy primarily of the Huskies Rashad Smith, who tallied 11 of Hamilton's points in the quarter. Smith scored 15 points in the first half and finished with 17. When Brown, who led Basha with 17 points, re-entered in the second quarter Basha trailed 19-12. He proceeded to score eight of his 10 first-half points -- all of Basha's points in the quarter. The Bears shaved the lead to 21-20, but ended up down 26-20 at intermission. Neither team got into transition in the third period and it was a half-court game that period. Hamilton (12-5,0-2 region) nursed a 30-27 advantage to the final quarter. Basha's Gabe McGlothan, who scored only four points ithe first three quarters, emerged offensively to put the Bears ahead with back-to-back hoops. A putback and 15-foot-jumper put Basha ahead to stay 31-30 with 510 left. McGlothan finished with 10 points. Three minutes later Basha's lead was still one (33-32), but the Bears produced an 11-0 run the final 2:08 . It started with a turnover at halfcourt via trap with Brown finishing with a layup. Brown followed 20 seconds later with a steal at midcourt and buried a one-handed jam for waht turned out to be a three-point play with 1:45 to go. If the Basha boys basketball team had a superiority complex brewing after yet another blowout win on Friday night, it wasn’t showing on the surface. The Bears downplayed a very impressive 75-44 win over Apollo on the final day of the VisitMesa Basketball Challenge at Mountain View. He’s got a point, but it’s just not the 17 straight wins to start the year. It’s the way Basha is going about it that’s even more impressive. The Bears are blowing away most opponents – winning by an average of 16 points – with their foundation (defense) and unselfishness on the offensive side of things has them looking like the 6A Conference favorite. But they are seemingly putting themselves a level about the rest of the state, especially after thrashing 14-3 Apollo, which had been one of the other top teams through the first six weeks. Terrell Brown was the offensive force in this one as he scored 17 of his game-high 33 points in the first half and nearly outscored the Hawks himself. Brown, who was 15 of 23 from the field, also had seven rebounds and was backed by McGlothan, who had 18 points and 12 rebounds. The Bears led 34-29 at the half on 64 percent shooting from the floor, and nearly matched it in the second half to go on a 19-4 run in the first 10 minutes for a 53-33 lead. The defense slowed Apollo’s terrific guards as Holland Woods finished with 19, and Dre Martain had 12 on 4 of 15 shooting. Terrell Brown, Brennen Davis, and Gabe McGlothlan got more assertive in the second-half and top-ranked Basha pulled out a road victory at Mountain View 50-45. The first half wasn't as easygoing. As always it was difficult for the opposition to get in a rhythm in Toro Country. Coach Gary Ernst had his Toros prepared for the Visit Mesa Basketball Challenge opener. Basha only lead 22-21 at recess and was wondering why they couldn't generate much offense. Coach Grothaus wanted them to attack more. "Just needed to attack a bit more. Gary(Ernst) always has a good gritty team. We had to earn this," added Grothaus. They did just that. Brown & Davis were getting to the hoop in the final half. But inside account was for another day. The game-changed though with Coleson Struhs ability to knock down the three. He hit six and had 22 points overall. Toros senior guard Nick Sessions kept the home crowd in the contest with 18. Mountain View (7-3) battled for the first 20 minutes. Struhs was too much to overcome and it never got within 5. "Its easier to play with my teammates opening that outside shot. We are clicking pretty well and we love getting to mix it up with out-of-state competition. The Bears get Alta from Utah next and Salpointe Catholic Thursday. The Bears improved to 14-0. They feel as confident but grasp the room for improvement concept. Top-ranked 6A Basha never trailed and led by as much as 18 in a 71-56 rout of Moreau Catholic, as senior guard Terrell Brown came away with MVP honors with 25 points, seven steals, seven assists and five rebounds. Senior forward Gabe McGlothan, who was MVP of his team's win Friday against Lake Oswego, added 16 points and 14 rebounds. 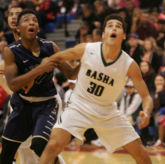 Basha relies heavily on those two leaders but have talented role players around them, making for a devastating seven-man rotation that includes the son of ex-Diamondbacks pitcher Omar Daal, Nico Daal, who chipped in Saturday with nine points. "They were are leading scorers from last year and both having better senior years," coach Mike Grothaus said of Brown and McGlothan. An ample helping of post-up game accented by solid perimeter shooting was the recipe for Basha's boys basketball team to reel off its seventh straight victory Thursday night against Cesar Chavez. Four players scored in double figures as Basha turned back Cesar Chavez, 72-60, in a 6A contest at Basha High. Basha, which won the Salpointe Tip-Off Classic going 5-0 last week, has added two power-ranking wins in three days. Chavez dropped to 5-2. The Champions were runners-up to Chaparral in the Paradise Valley Invitational last week. Senior forward-post Gabe McGlothan handled the offense in the paint with a team-high 19 points and continued his early-season average of a double-double (scoring and rebounding). Teammates Terrell Brown (17 points), Bryan Baptiste (11 points) and Nico Daal (10 points) supplied most of the the long-range stuff. Austin Picarello wasn't far from making it five in double figures, finishing with eight points. 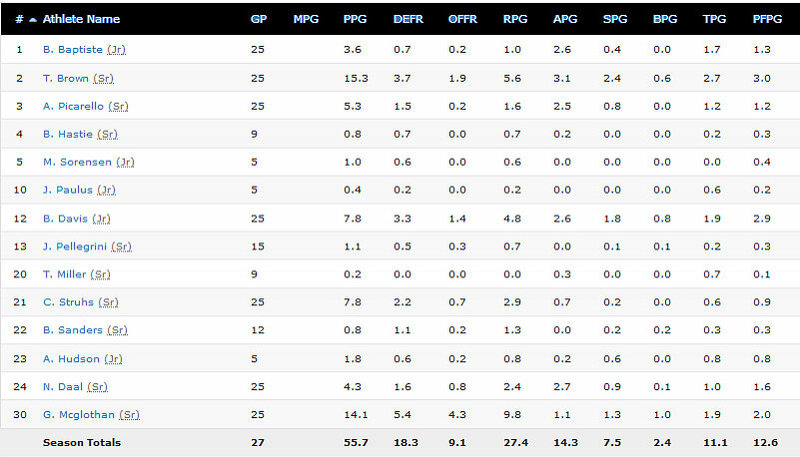 Seven of the eight players that saw solid minutes for Basha Thursday played on last year's big-school semifinalist. They are charged with aiding a return to that level or better this year. McGlothan connected on 9 of 14 shots and only one was from the perimeter. Brown, Daal, Baptiste and Picarello combined for eight threes -- four in each half. Basha led comfortably throughout the game. The Bears led by five after the first quarter, 14 at the half and 17 after three quarters. Cesar Chavez made one mild run at the lead midway through the final period. The Champions pared a 17-point lead to 59-49 with 5:20 left. A quick five points (a Daal 3 and McGlothan dunk) bumped the margin to 15 with less than four minutes left. That closed the brief opening. Chavez was limited to basically a two-man game all evening. Two of its top players didn't dress. Starting center Demond Hart, a 6-foot-7 senior, lasted less than a quarter. He was assigned to guard McGlothan. After some chippy play in the opening quarter that earned him a warning from game officials, Hart was disqualified with two technicals with 1:13 left in the first period. He scored four points before exiting. Without Hart, Chavez's scoring was nearly all junior guard Michael Rogers and senior guard Donald Carter. Rogers netted a game-high 31 points with his persistence and power taking him to the hole for most of his points. Carter's exceptional quickness did the same as he checked in with 19 points. Basha will face Catalina Foothills in the championship game thanks to a 57-30 win over Salpointe in the other semifinal game. The Lancers led 7-2 early but the Bears erased that lead quickly. Terrell Brown had 16 points and Gabe McGlothan added 10 for Basha. Rylan O’Brien scored nine to lead Salpointe. Majok Deng scored eight points. 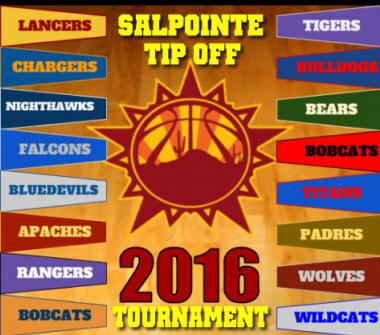 BASHA WINS SALPOINTE CHAMPIONSHIP - Basha defeated Catalina Hills 52-42 on Saturday and won the 2016 Salpointe Tip Off Championship.